The VIS 2nd annual College Fair was a success with 126 students attending; GEMS Academy, Middle East International, and our VIS high school students. The event attracted representatives from 6 universities from the Qatar Foundation, 5 regional universities, as well as 4 businesses. The Fair featured a full schedule of informational sessions. Following the fair, Dr. Mohamed Omar Zaghmout from Hamad Medical Company held an informational meeting with 17 female students who expressed an interest in the healthcare career pathway. The students were very attentive and engaged in the informational meeting. Attending a college fair is an important step in the college search process for many reasons e.g., making connections with college representatives, learning about program majors, and discovering a new institution. For those students who are undecided, this is a great chance to explore and see what’s out there. Even if you’ve narrowed your picks to the top two or three institutions, you can still inquire and see what else is out there…you never know, you could discover a school you hadn’t considered before. We look forward to next fall working in collaboration with our new boys’ counselor, GEMS, and MIS for our next college fair. There are other, less obvious, benefits as well: college fairs provide a wonderful opportunity to seek advice about not only a particular institution but also to learn about actions that can be taken now to better prepare for college. High School Students at VIS celebrated Pi Day on March 14th. Pi is the mathematical constant with an approximate value of 3.14, and it is celebrated worldwide on this day with contests, games, food, and fun activities. 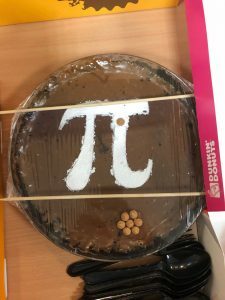 The VIS classes calculated Pi with the round foods they brought in, watched a video about the history of Pi and did activities that showed off their love of Pi. They also used the day to commemorate the birthday of the famous scientist and mathematician, Albert Einstein. Round foods were the choice of the day, with doughnuts, cookies, pizza, and a special Pi Day Pie. 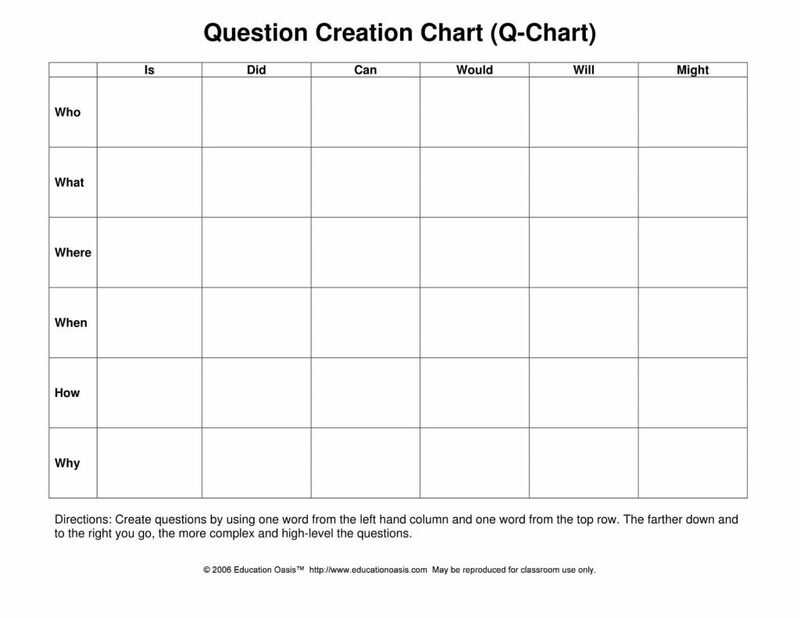 Over the past few weeks, I have been working on critical thinking skills through debate in the classroom. Debate is one of the best ways to get students to think critically and develop their rhetorical abilities because students are required to think and research an issue that they may have never thought thoroughly about before. On top of that, students are required to think through their arguments from the opposing viewpoint because they know that the opposing team will find holes in their argument if they do not. Debate and public speaking is something that comes very natural to many of our students as it is a very essential part of Arabic culture; however, it can be difficult to channel those skills into the more formal arena that debate requires. I found that the most difficult part of teaching debate was requiring students to argue a side of an issue with which they did not agree. Most of our students have never had to do that, so it really stretches them to think about the consequences of decision-making. It is likely that many of our students will take on leadership roles either in companies or even in the local government or diplomatic positions. In order to be successful in these positions, they will need to be able to think critically about their own assumptions and how those might impact the lives of the those under their authority. This debate offered a lot of opportunities for our students to stretch that empathetic side of their personalities. I was very proud of our high school students and seeing their hard work and research pay off so effectively. If you see Rashid Al Khater, Marcus Rydlo, or Jassim Al Thani (all 9th-grade students) in the hallways please congratulate them on for their diligent efforts! Critical thinking and higher level thinking should be valued in all 21st century classrooms! 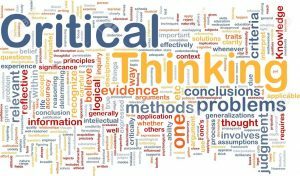 Below you can find curated resources for critical thinking and higher level thinking for all educators looking to increase rigor and help their students be successful 21st century learners! At Vision International School, students are taught to think critically. To help students develop their higher order thinking skills teachers use The Bloom’s Taxonomy Revised or Norman Webb’s Depth of Knowledge Levels. 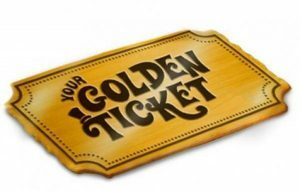 Remember the classic movie Willy Wonka and The Chocolate Factory where a Golden Ticket was the required pass that allowed the holder to get into Willy Wonka’s Chocolate Factory? Remember how, in the movie, there was this BIG mad dash of parents and children around the world to purchase Willy Wonka Chocolate Bars, all with the hope of finding just one of 5 of the lucky Golden Tickets? Reading Initiatives come in many shapes and sizes, with the aim of spicing up literature, giving children an incentive to open a book, and hopefully creating life-long readers. Reading for pleasure is identified as a key area for developing a student’s academic reading skills. Studies have shown that reading for pleasure makes a big difference to a student’s educational performance. Likewise, evidence suggests that students who read for enjoyment not only perform better in reading tests than those who do not, but also develop a broader vocabulary, increased general knowledge, improved communication and language skills, and a better understanding of other cultures. Vision International School Library runs many initiatives like Will You Find The Golden Ticket throughout the Academic Year to encourage reading for pleasure. 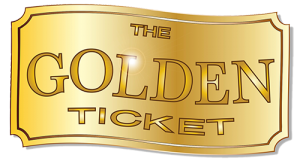 At the conclusion of the Reading Initiative, 145 Golden Tickets had been found, and several students received extra special rewards for finding multiple Golden Ticket Books. In addition to all the excitement built around the hopes of finding The Golden Ticket, we educators know that reading can be a fun and imaginative time for children, which opens doors to all kinds of new worlds for them. For the past 2 months, students in the VIS high school ELA class have been working on creating their own utopia worlds. This project is a great blend of both creative writing and informational research. 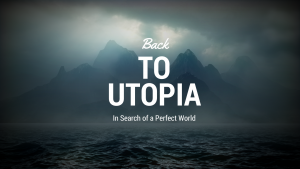 The utopia consisted of long-term essential questions that the students had to answer in 10 over-arching areas (Politics, Money, Housing, Art, etc.). For most of the sections of the utopia, students were required to do research about various techniques used currently or in the future and use that research in their project. Students had to back up their decisions with data and evidence, while still being allowed to create a society without limits. I believe that this project appealed to the students’ creative side while still forcing them to think about challenging, critical questions. Overall, I believe this project was really helpful in developing critical thinking skills for our 21st-century students. They were required to use technology to research, develop, and present their ideas in a meaningful way. It also helped them think about real-world problems that they see in their own society and to come up with inventive yet realistic fixes to those problems. This project is also modifiable to a variety of age groups from high school down to upper elementary. Thank you to Dr. Bobbi for the idea, and thank you to all of the teachers and administrators who took time out of their busy days to come and listen to the presentations–it really made the students more focused and intentional in their presentations! The 2022 FIFA World Cup will be the 22nd FIFA Worl Cup, an International soccer tournament which is scheduled to take place in Qatar in 2022. Qatar will be the first Arab country to host the World Cup and the first time it is held in the Middle East region. The tournament will involve 32 national teams, including that of the host nation, and will consist of a total of 64 games. 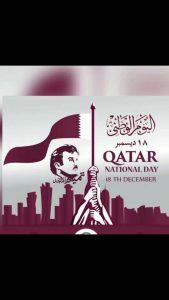 Inspired by Qatar National Vision, VIS High School Art students designed an Installation for the National Day. Their display included shimmering clay hand sculptures meticulously created by the students. 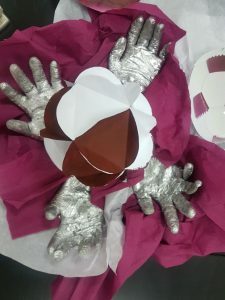 The boys also designed 3D paper footballs using 20 folded paper circles and gluing them together which they profoundly painted in colors of Qatar flag. Visual Art is offered as a High School elective at VIS. 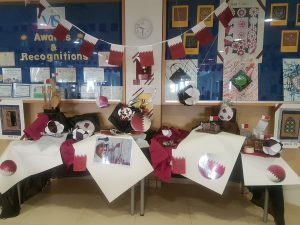 The students were extremely excited to work on this art project as it not only reflected their patriotic spirit but also demonstrated their love for The Emir, Shiekh Tameem Bin Hamad Al Thani who as a member of International Olympic Committee, heads Doha bid for 2020 Olympic games.The students proudly exhibited their artworks adding their beloved Emir’s picture and Qatar Flags adding to the VIS National Day festivities this year! Fine arts enrich our students’ lives and help them express themselves in creative ways! Model United Nations, or MUN, is an extra-curricular activity in which students typically role-play delegates to the United Nations and simulate UN committees. This activity takes place at MUN conferences, which is usually organized by a high school or college MUN club. 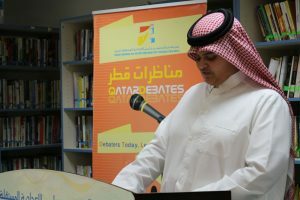 Qatar Leadership Conference (QLC) was a three-day conference that encouraged middle school, high school, and university students to become global leaders. It offered many useful sessions, mostly focused on leadership and international politics. This is the first year that VIS has taken part in MUN and the energy and excitement of our students make it worthwhile. 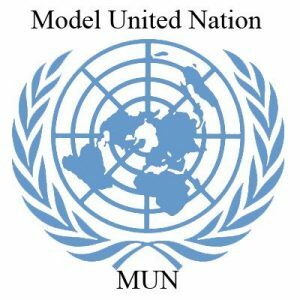 MUN is a way to become an active, more concerned global citizen, while in this era of globalization, being globally aware is more important than ever. Model UN also builds confidence, leadership, and diplomatic skills. It enables students to utilize research, public speaking, and teamwork skills. By engaging our students in MUN, we are working on shaping local leaders and global learners! The week of December 4th was Computer Science Education week. Vision International School, along with thousands of schools around the globe were taking the opportunity to be part of an exciting global movement last week and explored coding with students. All students grades 3 and up at VIS joined millions of students and teachers in over 180 countries, from Afghanistan to Zimbabwe, during the Hour of Code week. 2. Code.org is a must! 3. Make a simple app in one hour – Check out Code.org’s new App Lab activity. The Hour of Code has many other resources listed on their website (https://hourofcode.com/us/learn) such as Creating Your Own Google logo with coding. If you live in Qatar, you might want to check out the Qatar National Scratch Coding Competition. Kids of today need to understand programming languages to be prepared for future jobs. Everything involves technology today. Imagine what it will be like in 10 or 15 years! About twenty high school students from both the boys’ and girls’ divisions of Vision International School, Qatar took part in the 5th annual Ajyal Youth Film Festival in Doha, Qatar. Ajyal, meaning ‘generations’ in Arabic, invites people of all ages to come together and discuss cinema through events that inspire creativity and interaction. Driven with the goal to inspire and create, Ajyal Youth Film Festival has been designed to empower the region’s youth and to inspire film enthusiasts, opening up a fun and collaborative environment, where young people can express themselves through the beauty of filmmaking. The festival was held at Katara Cultural Village from November 29th until December 4th, 2017. The largest to date, it screened 103 films from 43 countries, including 20 feature films and 83 short films, illustrating the ability of storytelling to transcend borders, transform minds and touch hearts. Since the beginning of academic year 2017/2018, our students have been taking an elective Film Study class taught by Ms. Sukey Oleson and Mr. Karl Rydlo. Together with 550 other youngsters from 45 countries, aged between 8 and 21, the students screened and voted on 4 feature and 10 short films, including the award-winning animated film “The Breadwinner”. Executive-produced by celebrity actress Angelina Jolie, the film portrays a tale of female empowerment and imagination in the face of oppression, and a celebration of the culture, history, and beauty of Afghanistan. Festival also featured the Ajyal Talks, a series of open discussions about real, globally relevant issues and the power that film can have in increasing global awareness. Subjects included child trafficking, the ways in which media can influence perceptions, and the power of art in overcoming adversity. Vision International School’s students will further expand their knowledge in film-making by continuing to participate in their elective Film Study class that has been offered in partnership with Doha Film Institute. Dr. Bobbi McDaniel, the girls’ division principal introduced the program to VIS at the beginning of 2017/2018. The ultimate goal of the program is to produce a short film that will be featured in the “Made in Qatar Category” at next year’s Ajyal Youth Film Festival. The best part of the Ayal Youth Festival was that we could watch movies we would have never heard of or seen in the movie theatre! We watched movies we never heard of before, made new friends, and even got to see famous people! The best part was that Sheikh Tamim, The Emir of Qatar, gave us a surprise visit and I even saw some big stars including Sophia Bush and Kaya Scodelario. The full-feature movie that I enjoyed and voted for was and had to be Walking Out. Walking Out is a very interesting story about an urban teenager, who journeys to rural Montana to hunt big game with his estranged, “off the grid” father. I loved the story and how it was based on a book, which I have not read yet, so I am actually planning on getting the book. It got me interested! My favorite part of Ajyal Youth Film festival 2017 was Q&A session after movie screenings. In this section, we could ask someone from the moviemakers (director, producer, or actor) about anything from the movie. I participated in all of them! I think it is very important to expose young generation to filmmaking industry, for many reasons, for example, to give an opportunity to express their opinions and to enable them to learn more about a possible future career.